My two sons, age 7 and 3, own a fancy play kitchen that is fully loaded. Drawers stocked with nearly every imaginable play food. It sits proudly in the corner of our kitchen. 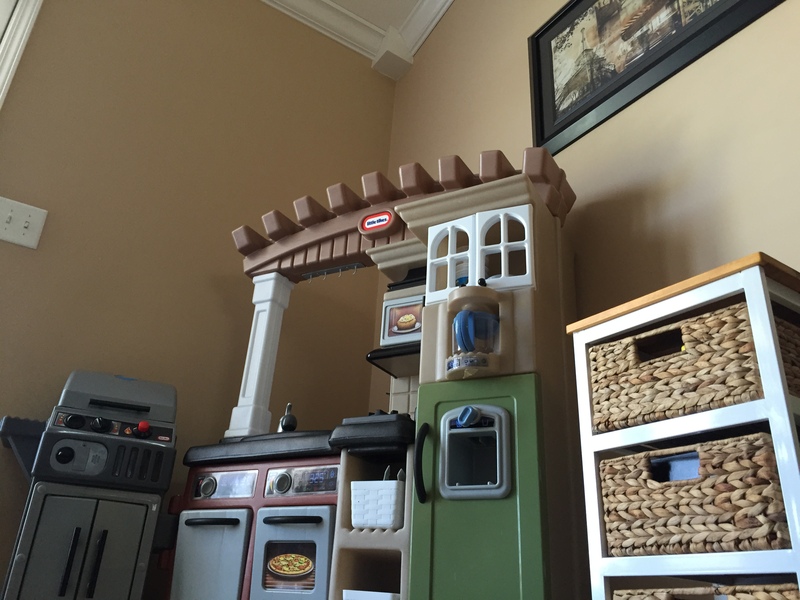 While they’ve started to outgrow the kitchen and it will be on its way to a new home with two little boys and a little girl, it was certainly well loved and played with in the Froman home during its tenure here. As if our ‘kitchen confession’ wasn’t shocking enough, my seven year old and three year old also love Shopkins. What are Shopkins you ask? Shopkins are miniature household items that have little faces on them, and they come in little grocery baskets that are colored pink or purple. Dare I even say they like Anna and Elsa? But do you know what else my seven year old loves? Star Wars. He has fought Darth Vader in person, and proudly wears his Clone Trooper and General Grievous costumes when the mood hits. He has ‘fully stocked’ Empire and Rebel Forces made out of LEGO’s and the LEGO Death Star still sits proudly in the middle of our kitchen table (since we’ve yet to find room for it anywhere else). And our three year old? He thinks he is a ninja. Whether it is a Ninja Turtle or a Ninjago fighter is to be determined. He also loves to play ball outside and gets into the ‘expected’ mischief that any three year old boy gets into. We all have Nerf gun fights and wrestle in the living room. There are girls who play football and pretend to mow the lawn alongside their Daddy and there are boys who play with Shopkins and have a play kitchen. Yet, it appears people do care. And they care deeply. We have been offended and have our scopes set on another Target (pun intended). This morning I watched a video that a local pastor shared on Facebook; calling us to action against this assault against God’s design. He shared his heart and boldly condemned Target for ‘bending’ because someone was offended, yet is hoping Target will change because he is now offended. It is as if offense only matters when we are the ones offended. Somewhere amidst it all we’ve made a spiritual and moral matter out of something to I truly don’t believe is. I guess that confuses me. I understand that there are very real gender and sexuality discussions happening in our nation; but to me this isn’t one of them. I guess I overlooked the part of the biblical narrative that said Barbie dolls were exclusively for girls and footballs were exclusively for boys. I missed the explanation about pink and purple being girl colors with blue and green being boy colors. There is no doubt that God created created men and women with differences. Our emotions and our physicality both vary; dramatically at times. This was done by design, and I believe our Creator continues to stand by His creation. What I fail to see is how the toy a little boy or girl picks up, which is designed to spark imagination, is an assault against God’s design. My boys have a few toys that many would label as a girls toy; yet it has done nothing to affect their masculinity nor their perception of themselves as boys. The same is true for the girls I’ve seen playing with G.I. Joe toys or full contact sports. Their gender identity remains the same. Teaching boys to be men and girls to be women is so beyond the toys the play with and the colors they like. As parents, we are the ones responsible for how we raise, teach and guide our children helping to shape and define their perceptions of gender identity; not Target (nor any other store). We should always be careful about the causes we attach Jesus to. It seems as if we are becoming known more for the fights we pick than the Gospel we should represent. Let’s all take a deep breathe and put our swords back where they belong. We’ll have an opportunity to pull them out at swing at someone again tomorrow; regretfully.